The SP500 has made an all time again today in the last minute of trading and I suspect there will be more highs ahead as I lean towards seeing 1600+ before a summer correction. What is not clear right now is whether the market is in a nested bullish 1-2 with a W3 about to show up (thus making 1577 a W2). 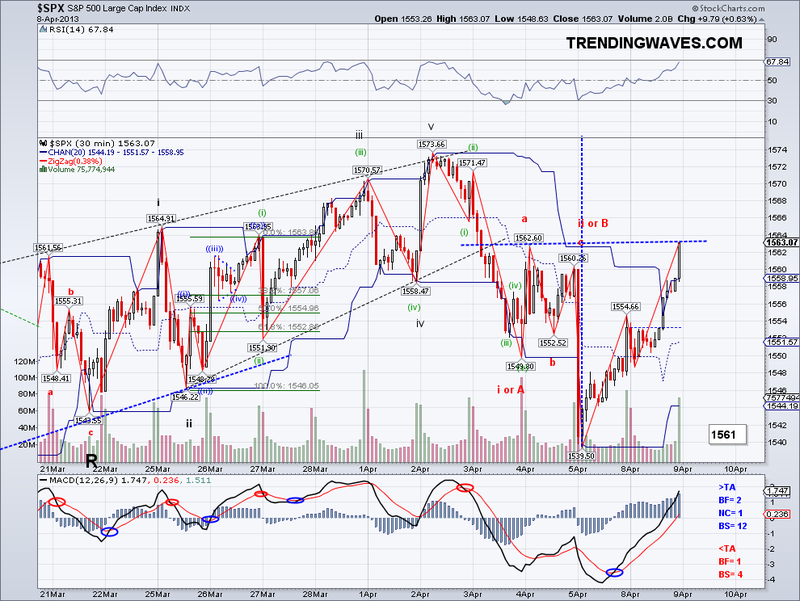 Or if there is an Ending Diagonal or Rising Wedge for the 5th leg of this W1 of Int W5. The short squeeze theory I talked about yesterday would result in a bullish W3 but it's hard to tell as this is uncharted territory for me. In the past there were clear defined resistance levels from the previous bull market (like 1575) but now there is nothing, so I am just assuming many traders went short or sold thinking 1597 was the top, specially when 1538-39 broke. But now that they see it is not the top, traders might jump back in and shorts will be forced to cover. That of course assuming people trade using technical analysis, which in itself is pure speculation. So we should see an interesting couple of days starting tomorrow. I am patiently waiting for more clues before going into a short term position. The C leg I had been expecting has not materialized and if we are still in a correction then the market would be on a B of an expanding flat. However, I am leaning towards labeling this leg a W3 with the A leg being a quick Zig Zag correction. I'll have a better idea tomorrow and I'll label accordingly. I started leaning bullish once the Short Term Trend went bullish so just have to find a count that fits to hedge/take profit/short accordingly when the time comes. Also, I posted the Int Chart so you can see how I've labeled the waves. 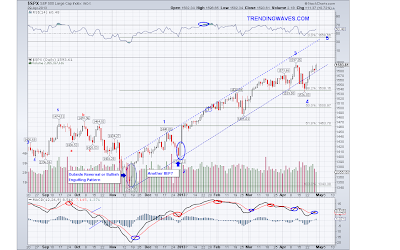 The bullish daily MACD cross and the corrected RSI leaves room for substantial upside in May. There is a good chance if 1597 breaks, bears will be running for the hills once again and see another big rally.. If I was short I would set my stop at 1597-1600 so we'll see what happens if this level clears. 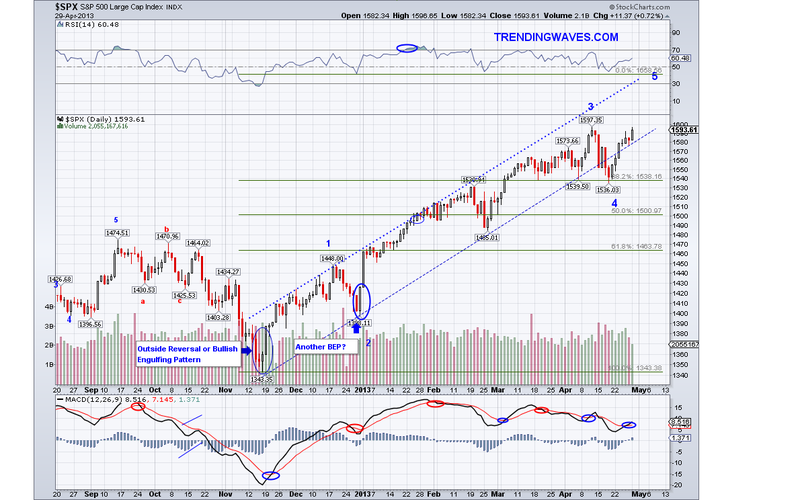 Market started its retrace as I had been expecting and so far it is looking like the Trend Average will hold. 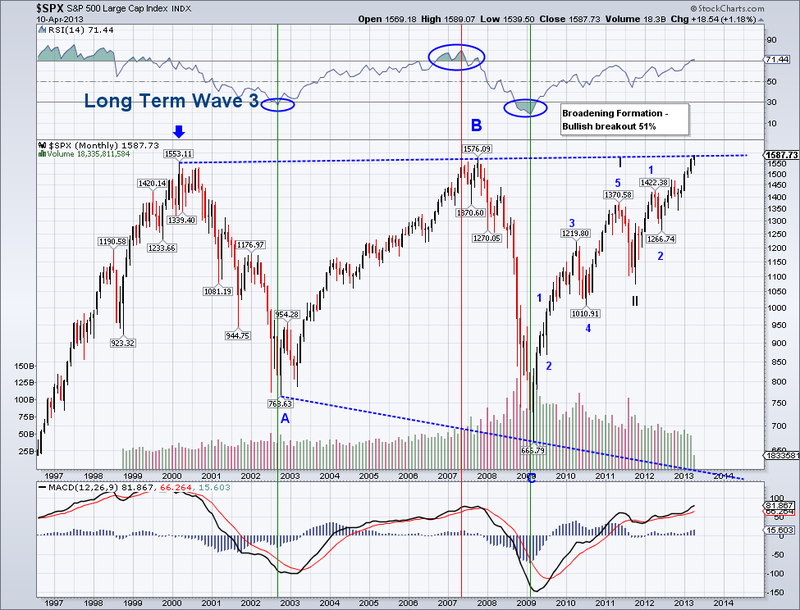 And if that is the case then there is a good chance we will see another all time high next week or early May. There is also a potential cup and handle pattern, which will targets 1658 if the "handle" is completed and the market breaks out. 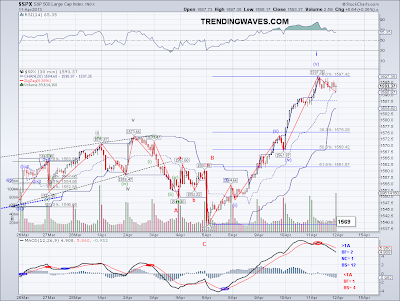 This all lines up well with the 5th wave completion of a III and a summer correction. I ended up position trading VXX again and improved it by a few cents so that trade is looking good so far. It is up almost 3% from my net price but the index is actually 4 points higher from where I bought it (1578). Goes to show how volatile/crazy this ETF is. 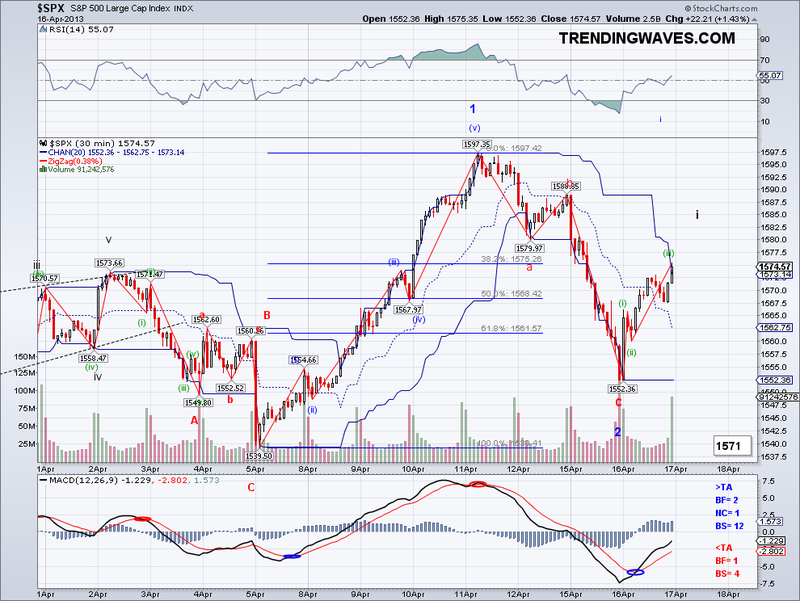 Hopefully, we'll see the TA tested early next week and I will be closing out the position. 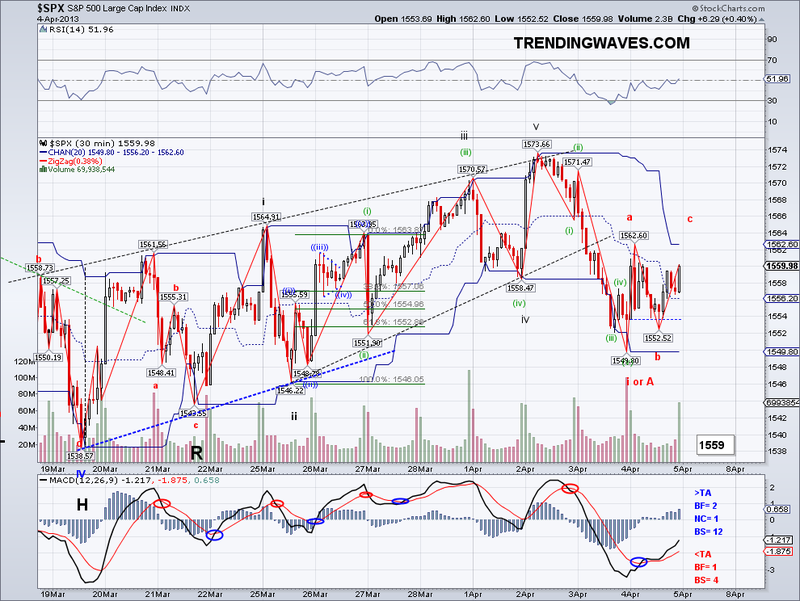 I think we now have an obvious bullish 5 wave count and the bearish case looks dim given the bullish momentum. However, I think the structure from 1536 is complete or almost finished so now I am just looking for a test of the Trend Average which currently is running at 1566. 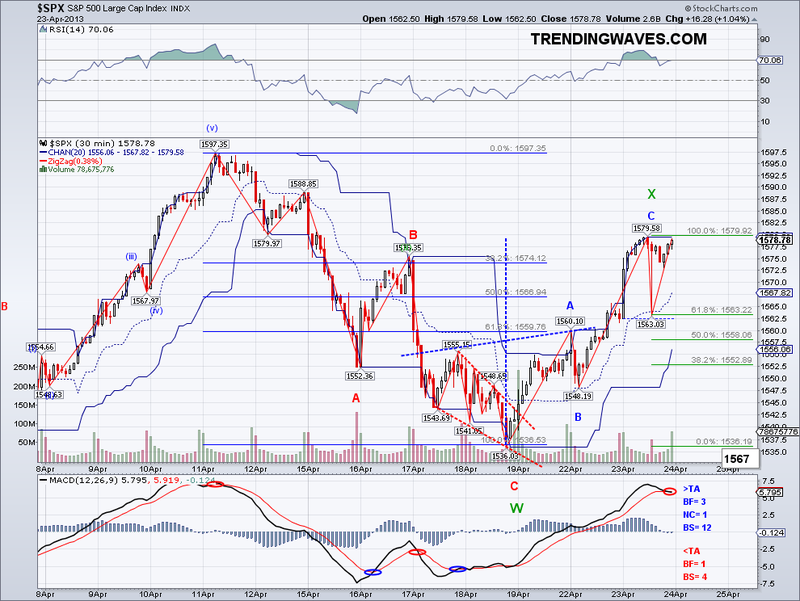 If this 5 wave count is the W1 of the final Int W5 then I project 1640-1662 as the ideal target level. Last time I projected 1600+ the wave from 1539-1597 was reversed completely but now that the market has somewhat corrected, odds favor 1600+ after a correction. I guess sell in May and go away will be the right thing to do this year as well. I am keeping my VXX position until the TA test and so far it has actually gone up despite the market making new highs for the 1536 wave. So maybe I'll able to squeeze a buck or two if 1560 gets tested? at that point I will most likely go margin long. Also, the HSI is in a confirmed W3 (of W1?) so that helps global mood for bulls. Also, now that FXI has rallied 7% in one week from its 2013 low last week maybe the correction is done there as well. Ironic that short interest on it was at the highest since 2007 and someone made a $16 million bearish option bet (largest single option trade of the year) before this big rally from nowhere. 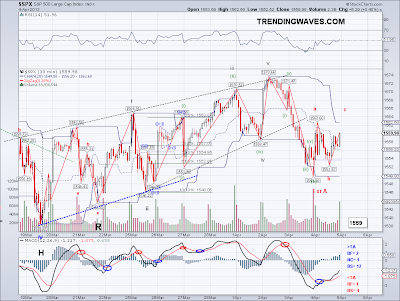 The market triangulated most of the day and put in another higher high for this wave which is now starting look better as a 5 wave count than an ABC. But since C waves can extend 1.618 (1586), I am still assuming a strong bearish wave will come. However, if this wave ends in the 1590 area or higher, odds are this is an impulse wave which will not be retraced completely, meaning 1536 is the low for the correction and we're seeing a higher degree 5 wave count unfold from that low. I position traded my VXX in the morning to get a better cost average and now I am getting tempted to close the position at the test of the Trend Average at 1566. 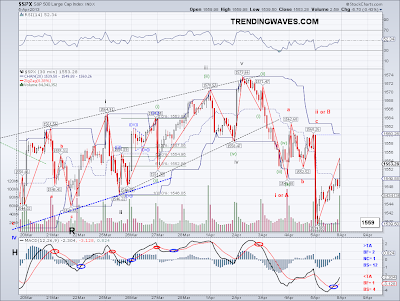 But I'll see how the bearish wave evolves after the market finds a top. 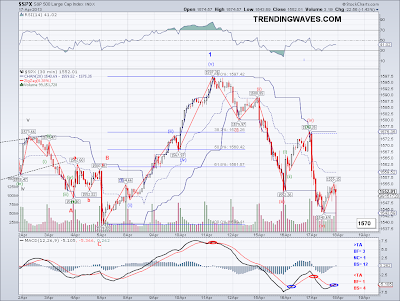 Anything less than a strong sell off, makes the bearish case suspicious. Especially if the TA turns positive, which it will tomorrow if the market closes above it again. Bearish H&S or Bullish IH&S? The market rallied as I expected (despite being down as much as 7 points in pre-market) to the 1570-1575 level on positive earnings. And now that the right shoulder of the Head and Shoulders is there, we'll have to see the magnitude of the coming bearish wave to get an idea of when the correction will end. Going by pattern alone, the target is 1478 which should coincide with the 200 DMA assuming it takes couple of weeks to get there. However, there is also that potential Inverted Head and Shoulders I've been tracking so watch out for the 1552-1556 level. 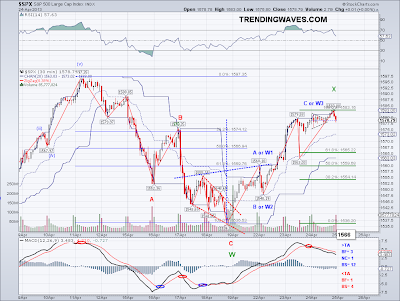 If that level holds then that pattern targets 1618 (Nice Fib number there). Therefore, we have another case of one of these patterns eventually failing (Bullish wave going beyond 1597 invalidates the H&S), which one will fail is anyone's guess. 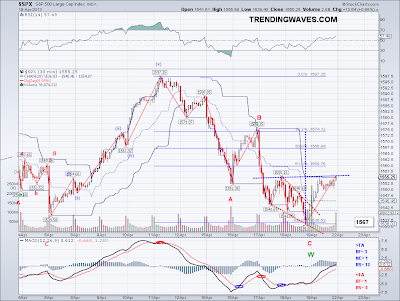 But at least we are aware of what key levels to watch. I am still labeling the waves a double Zig Zag and should the Y wave equal 1.618 of W, then we will be looking at 1480 exactly which will fit the H&S target and 200 DMA nicely. Per my plan from last week, I loaded up on the same number of VXX I've been trading around the 1578 level. And the real challenge will be to take profit or not to take profit when 1552-1556 comes. I hope they market will make it easy for me and just gap down that area.. lol. 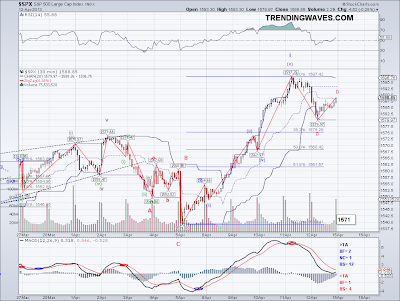 The market got very close to touching the Trend Average today and reaching the 1570-1575 level I mentioned last week. 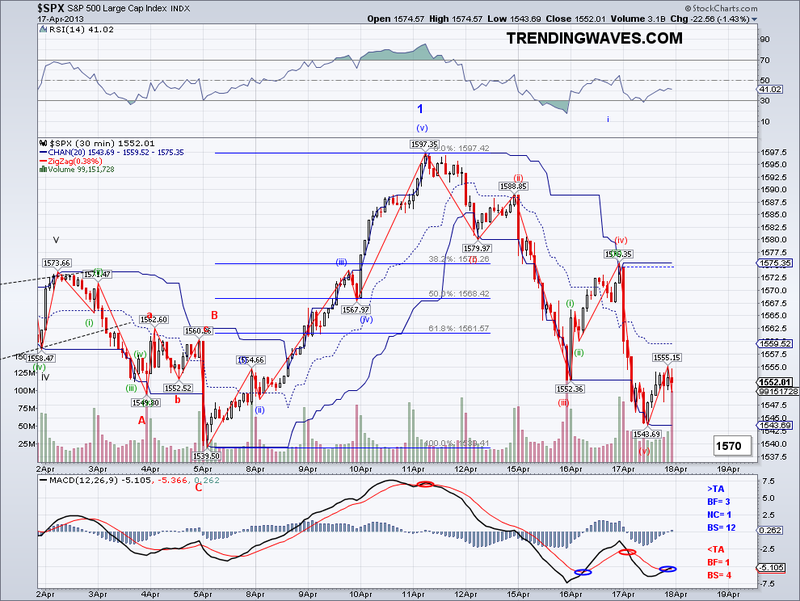 So perhaps we will see this area challenged tomorrow before the next bearish wave. Now, I think almost everyone is aware of that right shoulder for the Head and Shoulders pattern so I think it is highly likely many will sell or go short at that level. 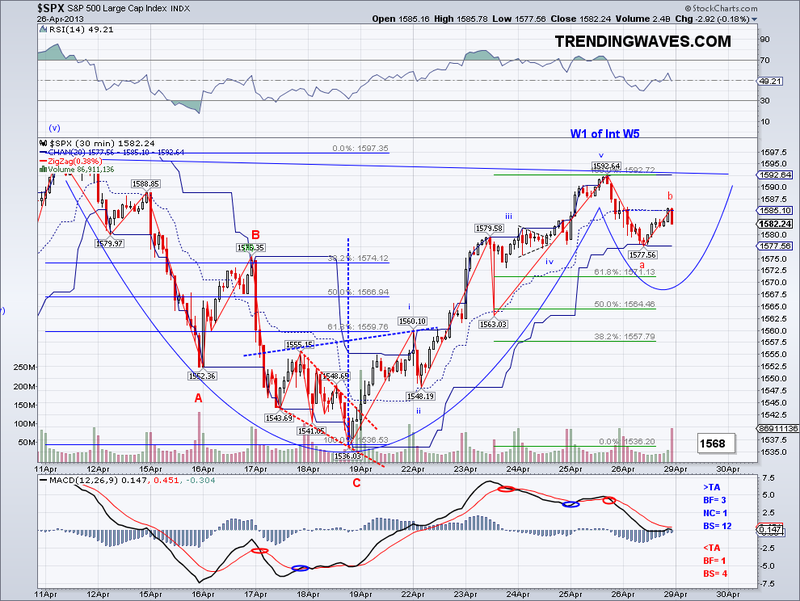 But the real level to watch is 1552 as that support level creates the right shoulder of an Inverse H&S. So ideally I'd like to see the pattern broken (either one) with one strong wave, anything that hesitates around key levels can make you a bag holder. I am planning to load up on VXX again on the right shoulder but the trick will be when to take profit. Other than that, the HSI and SSEC seem to have finished their respective corrections. One thing I find interesting is that the short interest on FXI (which is a proxy bet on SSEC) is at the highest since 2007. Also, I read someone just made the biggest bearish option in the markets in 2013 bet against FXI last week (right before it went up 4%). So we'll see if this is a classical example of a contrarian trade. I am all long there so I hope this is the case! The market staged a decent bounce today with the exception of the DOW which was dragged by IBM and I think there is a good chance the market will challenge the 1570-75 level, which will be important as failure to overcome this level will likely result in further lower lows. As I mentioned yesterday, this level coincides with the right shoulder of an Head and Shoulders and that targets 1480, so perhaps we will get there in a double Zig Zag? I've seen some bearish calls on the mainstream media and on some blogs but I maintain the view that as long as the US economy grows, the market will maintain current levels and go up accordingly. It almost seems like they all forgot the market has gone up almost 20% in less than six months without much of a correction.The next few sessions should get interesting.. The market put in another lower low today and this confirms 1597 as a significant top of some yet to be determined degree. 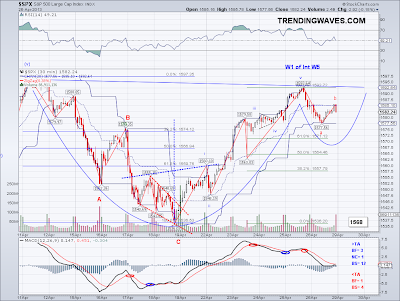 I originally had 1589 as the "ideal" top for the 5 waves from 1343 but when the market made a significant peak at 1563, I figured that level would be best suited for the end of W3 of W3, since 104*1.618= would have been 1566. So I assumed another wave in equal size to W1 at 104 would start from the 1538-39 level, which was greatly supported by that massive bullish wave that started after an abrupt bullish reversal at 1539. But now that the market managed to retrace all its gains and breach support, the question is 1597 the end of a 5 wave count from 1343 or is 1597 the real end of W3 of W3. It would have been much easier if the market followed the count as it would have made it more predictable. But I am sure we all enjoy a challenge, so we'll just have to figure this out as we go along. The Short Term Trend is officially bearish and this bearish wave from 1597 looks better now like a ABC than a 5 wave count as it did yesterday as the "C" leg is almost the same length as the "A" leg. I could still label it a 5 wave count but the 5th wave is by far the longest and the W4 correction highly pronounced and disproportionate to W2. So I will label the end of this apparent Zig Zag a W, which assumes a double Zig Zag and a correction into May before the resumption of another Int bullish wave. If the market found a bottom today, this could serve well as the neckline for an Head and Shoulders targeting approximately 1480, which could be the level where the 200 DMA rises to taking into consideration this correction will take a few weeks. So my plan is still buying back VXX around the 1570 level assuming further downside. However, should the market stage a mad rally from here to recapture the trend, then that will imply 1597 will be challenged. 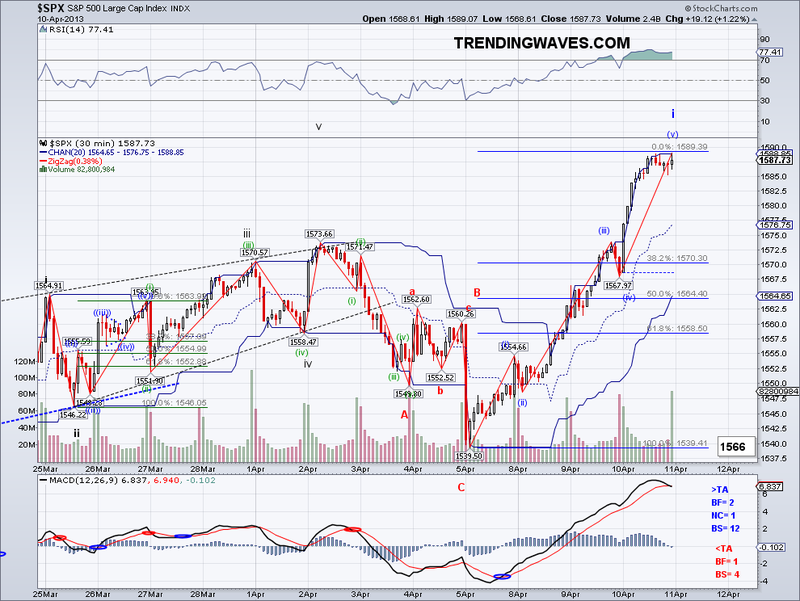 The market invalidated the count I had yesterday and put in 5 waves down to 1543 in a somewhat odd looking structure. But the count is clean so I am now assuming this is an A leg or a bearish W1 and now we have to see what the bullish response will be starting tomorrow. 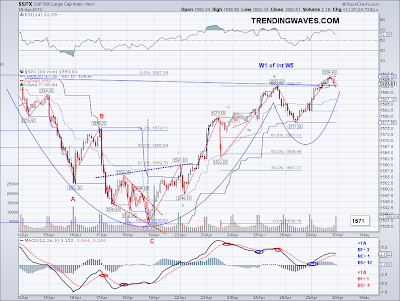 If we get a stronger wave to the 1570 level again, the market could be repeating the Inverse Head and Shoulders pattern we've seen a few times this year already. However, if the market bounces to the Trend Average and fails to capture it, then it might be setting the market for another bearish wave to break the 1538-1539 W4 low. As it is now, the fact that there is a significant higher high and a higher low points to a correction and until support is lost, the assumption is the market is just consolidating. I will be buying back VXX on the bounce so I am hoping a good entry point at the 1570+ level. The market seems to have put in a bottom at 1552 and if my assumptions are correct, then the ideal target zone will be around 1585-90 before the market corrects again. 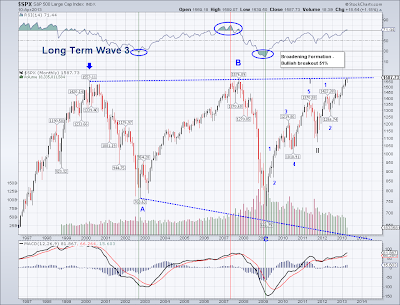 I think as long as the market keeps the Trend Average positive, the market should start trading above 1600 soon. If the market surprises (me) to the downside then the number to watch will be 1539 as I mentioned yesterday. 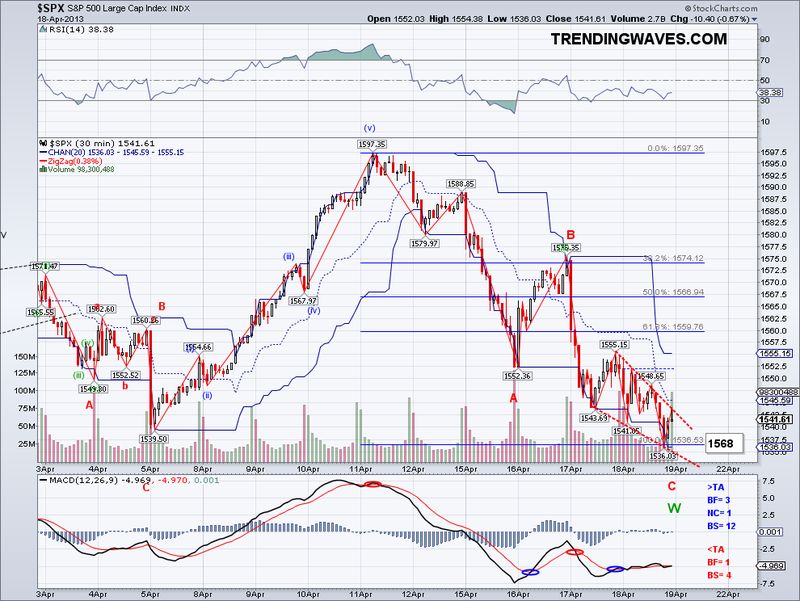 For now, 1552 just serves as another higher low and key support. I am on the sidelines on my short term trading account as I am waiting for higher prices but I'll set my automatic trigger at 1588 for now to buy back the VXX position. I think if 1588 hits then VXX should trade around $18 and that would improve my position substantially, we'll see if my assumptions are right.. 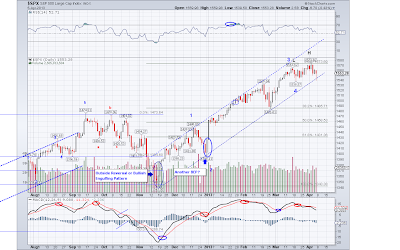 The markets put in a C wave as I had been expecting, what I didn't see coming was the market losing the 1570 support and the Trend Average in one shot. 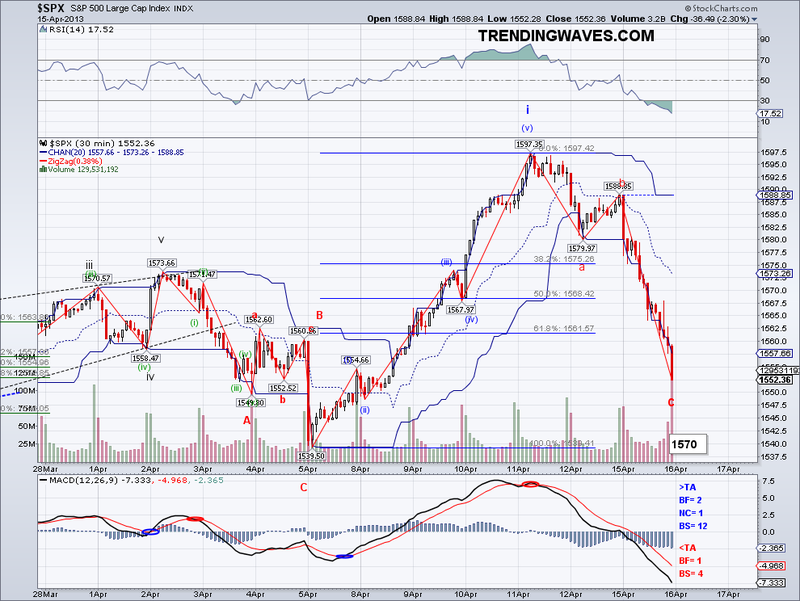 But as impulsive as this bearish wave looks, it is still a C wave until 1539.50 gets broken. Until then, my assumption is this is a correction that will end in higher high to put in a bullish W3 to line up with a May high. Technically speaking, we could be seeing the start of a rising wedge for the final 5th Int wave but it's too early to tell at this point. The cause for the sell off was initially the "softer" data from China and then commodities panic sell off driven by Gold. Tomorrow we'll have to see how the market reacts to the terrorist incident in Boston. Terrible that we have to deal with this kind of crap so often. As you guys probably know, I had a small position in gold last year but I sold that and exchanged them for FXI. I never really broke down the waves for gold but considering the price went from $800 just 2-3 years ago to $1900, it's not all that surprising of a correction. However, unlike a stock, there is no "PE" to gold as its value is primarily sentiment driven. So who knows where the bottom will be for that.. and on China, I find it interesting how 7.7% GDP growth is a "disappointing" number for an economy that size. To put that into perspective, 7.7% growth on an economy like China creates an economy the size of Switzerland or Saudi Arabia every year andd an economy like Spain or Australia every 2 years. So being 100% long on China and enduring the correction is completely ok with me as I directly own businesses that make money in a continuously growing market priced at an historical low PE. If I had cash, I would buy more Chinese shares but I am maxed out at this point. I know someday I will look back and ask why this was not obvious to others. For trades, I sold VXX again at the TA and improved my cost avg to $19.50. If the market goes below 1539.50, then I'll be forced to close the position and take the loss but I am assuming I will be buying back below what I sold today so looking for market upside to reload. Even if I took the loss, I would still be ok considering all the trades so I'll take whatever the market has. Lastly, I did not win the lottery so I guess it will have to be another time..
Target for final W5 1642-1668. A few days ago I posted a revised target for the end of the entire wave from 1343 at 1617 after seeing confirmation for Int W4 and the initial strength of the first bullish wave. 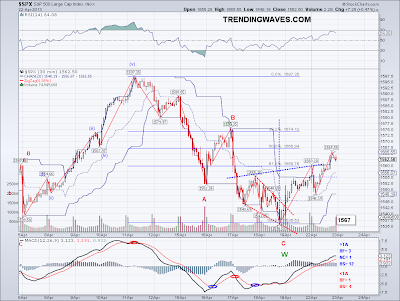 The day after I posted this target, the market broke out decisively out of its trading range and put in one of strongest bullish waves for the year, making my revised target somewhat easily attainable. 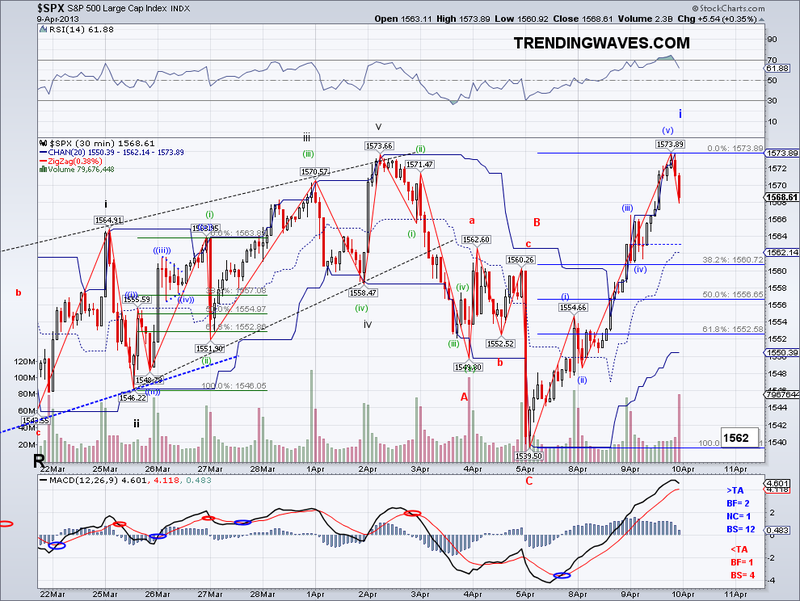 But now that we had the top of this wave confirmed, I can go back and re-calculate the optimal target. 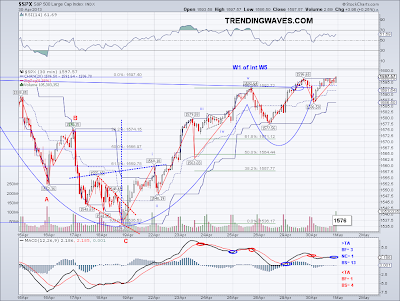 Looking at the charts, I think is very likely that Int W3 topped at 1563 and the two bottoms (1538 and 1539) were Int W4. 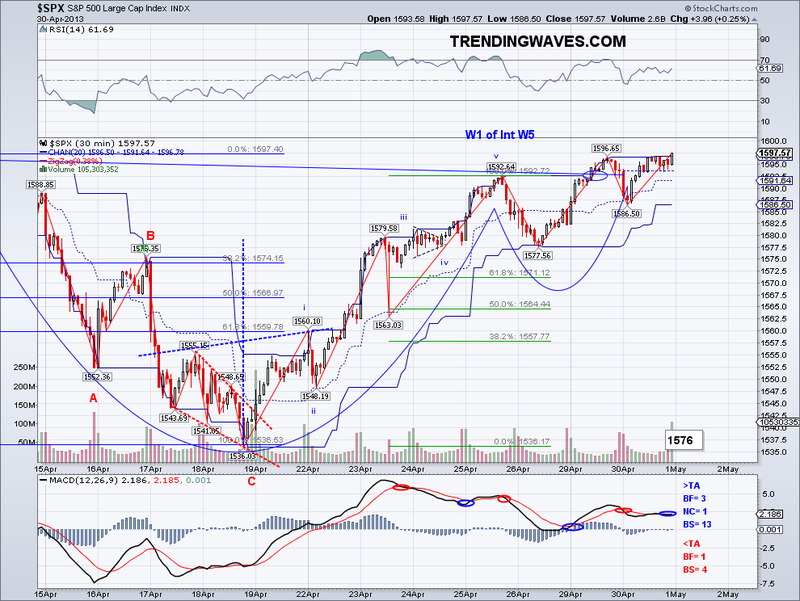 The previous top I had for W3 at 1530 was actually the top for W3 of Int W3, just like 1485 was W4 for Int W3 and not "the" Int W4 I originally thought when I projected 1589 as the ideal target. So now that the picture seems more clear, if we add the length of W1 to 1538 then we get the ideal target if 1642, which would line up with the May time frame. The one thing that remains to be seen is how the wave from 1539 will behave, if it breaks into a 5 wave count then I have a higher target at 1668. 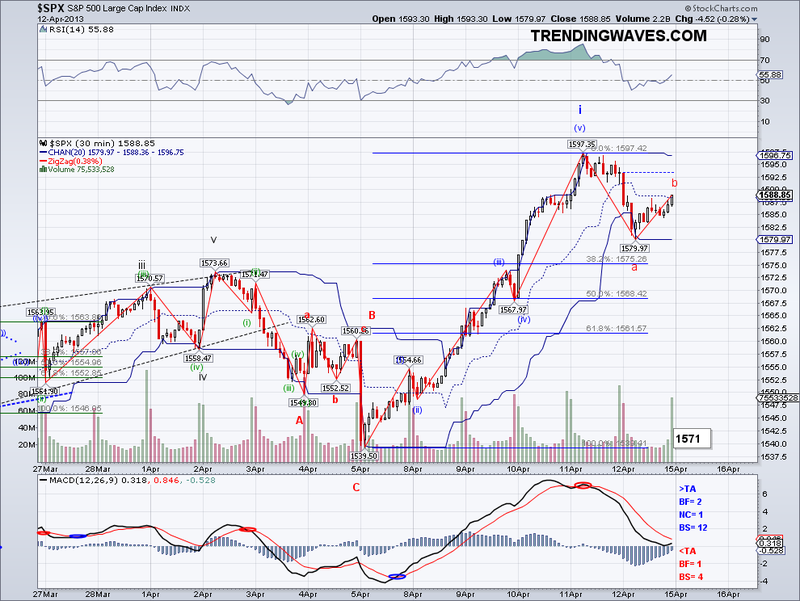 So a general target range for the end of the entire wave is 1642-1668. With that said, the structure could be complete as it is if we use the initial assumed parameters but all trends are supporting higher prices so I'll go with the new targets. 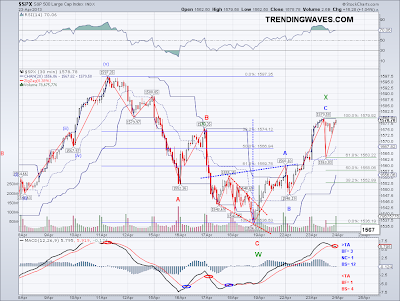 Today the market started its correction and I am assuming an ABC ot a double Z. 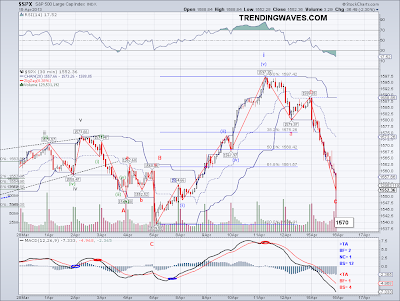 If the correction tests the Trend Average or enter its Fib retrace territory, I will assume we are seeing a 5 wave count and now a SAW3. I ended up position trading my VXX bag and improved its cost by 35 cents, so my cost avg has dropped to $19.86 which is not too terrible of a price. And I will exit the position if we test the TA and buy back in the 1600's.. that is of course assuming the TA test holds. The market has continued the bull run and now the bullish wave from 1539 is 58 points, almost matching the strongest bullish wave put in initially by the Fiscal Cliff resolution. And I suspect what is driving the rally after the break out is all the short covering after the all time high was taken out. I talked about this around the time when a solution was found for Cyprus. I figured if that level from 1565-1576 was taken out it should theoretically make shorts run for the hill and I guess I was right on that one. They were just holding out strong until the moon screwed them over.. and since I am assuming this is a short covering rally, I don't see much of a pullback given the fact that there are people like me with shorting instruments (VXX in my case) that will be selling on the dip to get rid of these positions. 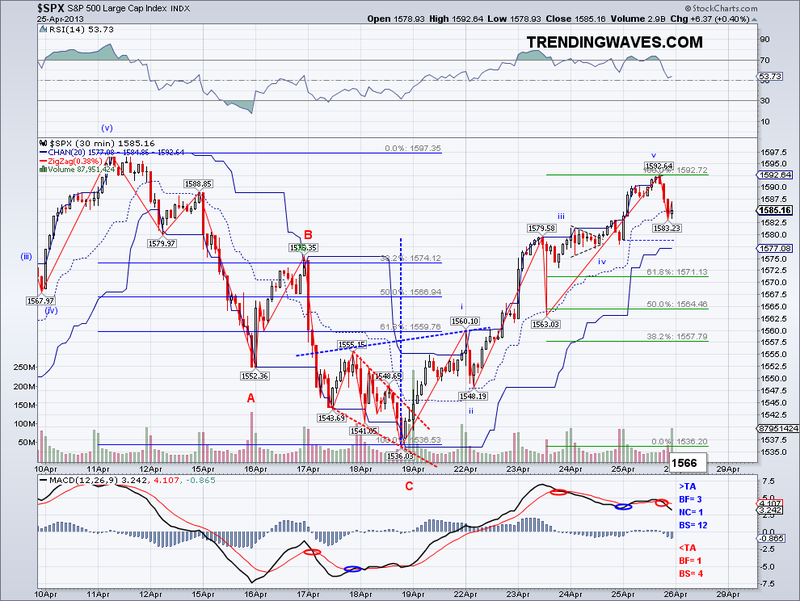 So perhaps we'll see some sort of sideways correction to digest gains and more short covering before nailing 1600+. So now that the 1600 target I had for 2013 has been technically met, I'll be looking at the charts over the weekend to see what other possibilities are there after we see a significant correction. Fundamentally speaking, the US economy is doing better but I wouldn't call our current growth optimal by any stretch. I think the best question is will the US economy gain enough traction on its own to survive without any more liquidity infusions. The idea is similar to loaning out money to a money losing business until it can regain its footing, think General Motors.. will it work on the US economy? that remains to be seen as this I believe is a first ever in history. If it does, Bernanke will be immortalized and the markets will go up substantially until the next recession comes. Btw, that screen cap from Twitter yesterday was the 1589th picture on my phone. A picture of 1589, on the day the market topped at 1589 that just so happened to be 1589th picture on my phone. I was calculating the odds of that happening and it is 1 in the hundreds of thousands to millions (depending on what parameters I use). So I will be playing 23 lotto tickets (1589 added together) using a combination of these numbers. Maybe that will accelerate my trip to Easter Island! my grandpa won the lottery after all (in 1930's Cuba) and I wouldn't be here today had it not been for that lottery ticket that someone else gave him.. so who knows, maybe I'll get lucky. The market has finally reached the 1589 target I first posted early March and now there is complete wave harmony :) What has been surprising is that this rally came out of nowhere as there is no significant market moving event. I thought the Cyprus resolution (remember all that end of the word drama?) would cause a rally like this one but markets didn't do all that much. What we have now is the second strongest bullish wave of the year at 50 points, which I am labeling a "Stand alone W3" just like the wave from Jan 1st, which ended up being 130 points. And looking closely at the 30 minute chart, the market actually did put in a right shoulder for the IHS but it was a much smaller bearish wave than I had expected. 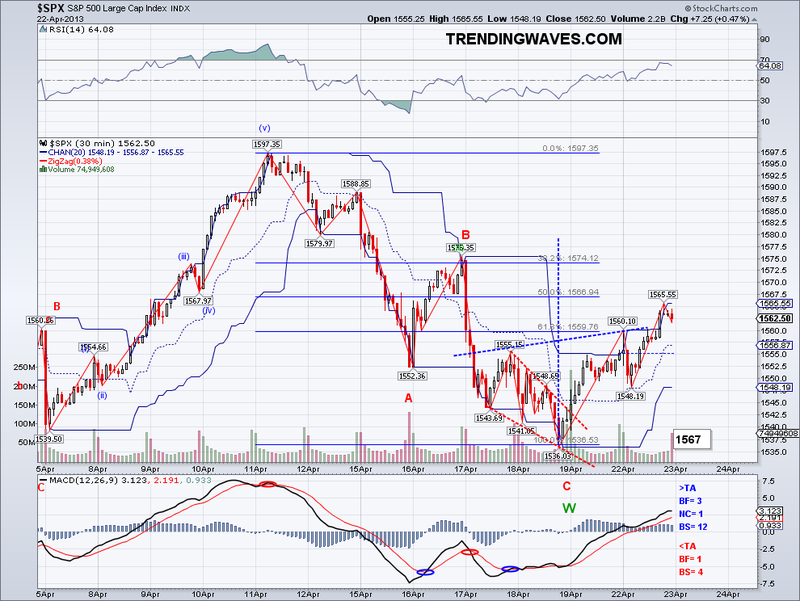 So now that we are at 1589, the target I posted yesterday is looking fairly close. However, since I am treating this as a SAW3 (yes that's my own invention), this is free to go all the way to 1650 in May, right before we get Fiscal Cliff 2.0 which will serve as an excellent excuse to correct again. If we get to that level, chances are we are seeing a break out of the Broadening Formation below and a multi-year and possibly multi-decade bull market. 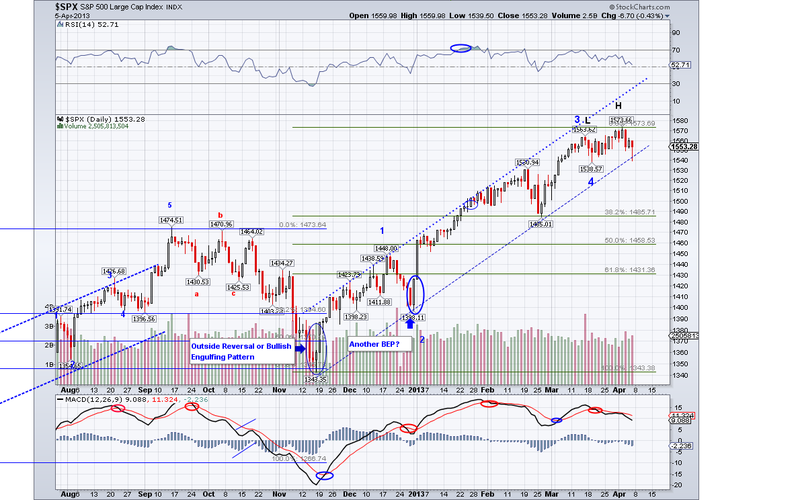 The market continued its bull run and invalidated the H&S pattern on the Long Term Chart. 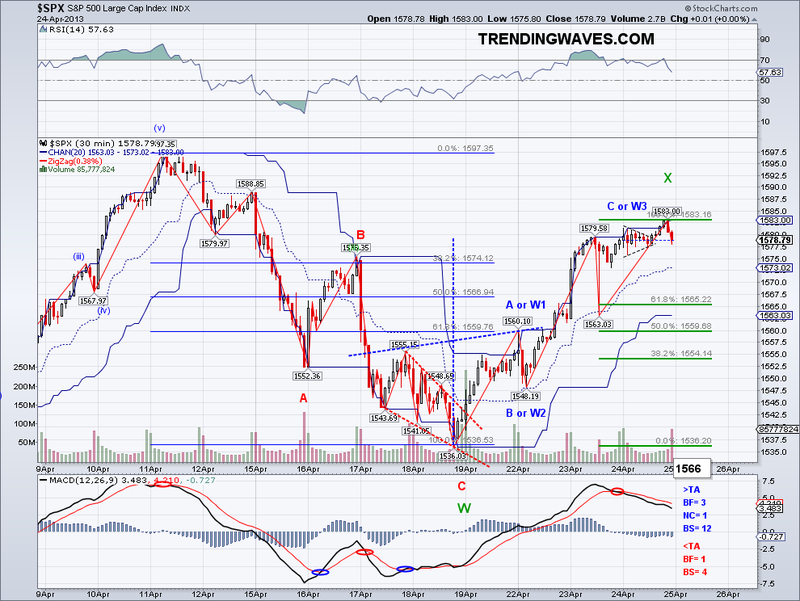 And it now looks obvious the 1539 low was yet another base for another likely bullish 5 wave count. 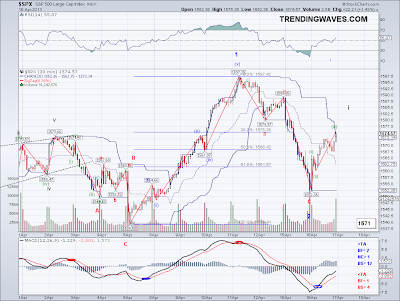 Last week when we first saw the first bearish wave I pointed out the option of a 5 wave bearish count to 1520 or an ABC stopping at 1538 and then going to an all time high. "So before getting ahead of ourselves, we first need to see if we get that 5 count or another ABC correction and another higher high. If this turns out to be an ABC correction, then the market should bottom around the 1538 support level from the previous Int W4 or ABC." The market managed to put in a higher low and one of the most bullish waves of the year (35 points so far) seemingly out of nowhere, as I can't find a catalyst that would cause this much bullishness. Perhaps it has something to do with the moon or me buying VXX (and NOT taking profit when I should of have) ..lol. 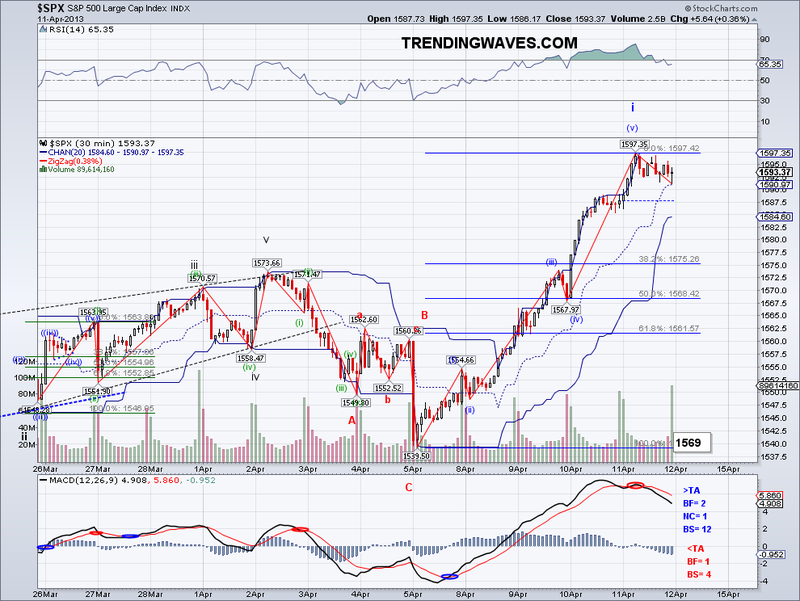 So now that we got that out of the way, the new preliminary target is 1617 in May IF this is a W1. And perhaps then, we should see the market hit the upper channel of the Long Term Chart and finally put it "the" top for the rally that started from 1343 (amazing how much the market has advanced in just a few months). I am officially holding a VXX bag and my plan is the same as yesterday, get rid of it on the next bearish wave unless we get an amazing sell off taking out 1538.. which I don't see just yet. Good thing I am also long so I can look at that portfolio and pretend I am not a bag holder.. 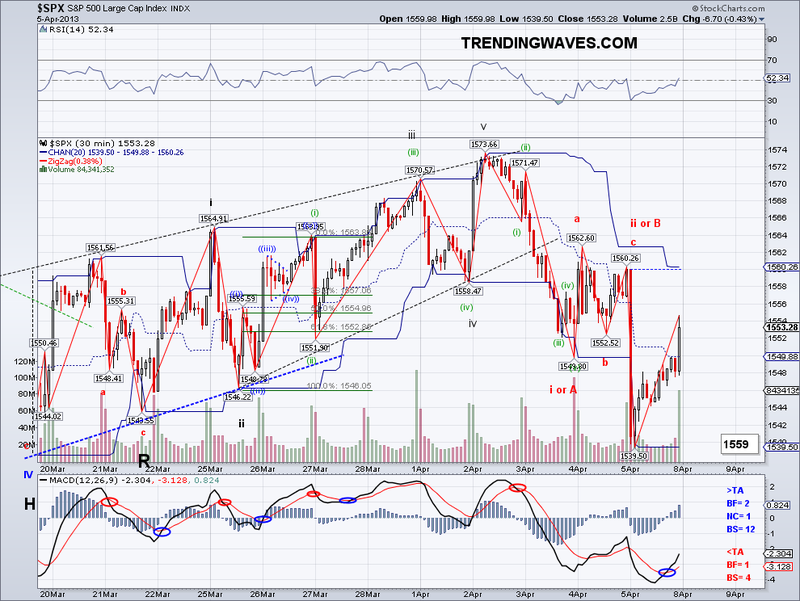 The market continued its rally from the 1539 low and it invalidated the bearish nested 1-2 count. 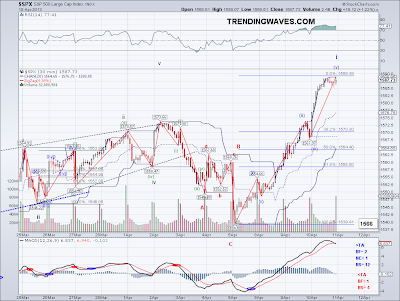 And from the look of the wave, this could turn out to be a bullish W1 like the other two times we've seen this year. Also, the market closed above the Trend Average and threatening with turning the trend back to bullish with another solid positive close. 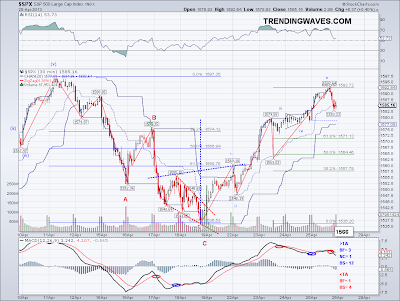 Looking at this short term, the market seems like its headed to 1590 area based on the possible IHS and wave projection. However, the market also put in the right shoulder for the bearish Head and Shoulders (please refer to post from Friday) that targets 1503. 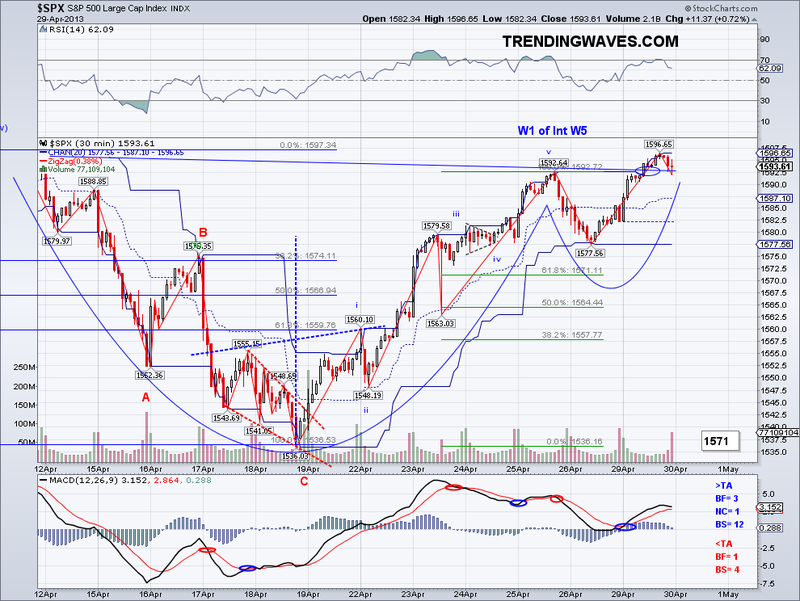 One of these patterns will eventually fail, the H&S fails if the market goes above 1573, the IHS fails if 1538 is breached. So the best thing to do at this point is wait for these levels to clear and get a better idea of where the market is headed. I am still holding VXX and will sell if we get anything less than a sell off on the next bearish wave, specially if the 1545-48 area holds. I mentioned last week when the correction started that we could get an ABC to 1538 and then see new highs or a 5 wave count to 1520 with further downside to come and so far it seems like the ABC is the most likely. So if this bounce turns into a bullish wave on Monday, then I am expecting another potential Inverse Head and Shoulders that could target 1580. With that said, the last two times we saw these ABCs I leaned bullish because of the incomplete wave structure and the Trend Average being bullish. But this time, I am satisfied with the wave structure as it is and most importantly we have a confirmed change of the short term trend. So in this bearish scenario, the market could be putting in a bearish nested 1-2 that will reveal itself early next week. Also, if you look at the long term chart I put up today, we now have a neckline for an Head and Shoulder that would target 1503 if complete. 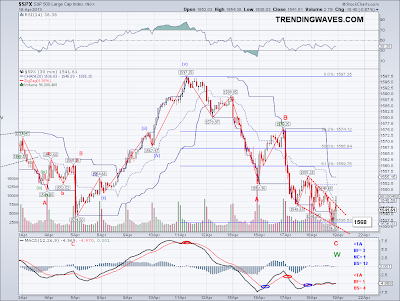 Which way the market will go is uncertain as of now but going by the TA, I am positioning myself for downside. I am still holding the VXX I bought yesterday and did not sell today when support hit. I suppose greed got the best of me as I was up over 5% on the trade I initiated just yesterday but VXX is just a weird animal. I had been calculating and expecting a $1 return for every 10 SP500 points retraced but after a 20 point drop it was just up a little over a dollar so I decided not to take profit until I saw 2 dollars. Instead, this demon gave up ALL gains and ended the day flat despite the market being down several points. Quite frustrating to trade volatility but it is very challenging and that's why I probably enjoy playing with it. I figure, at some point I will get the hang of it... and maybe early next week I'll get my $2 dollars!! Today I executed my reloading plan, so I am back in VXX at $20.20.